One of the more interesting things about working on Joni's website is reading the emails the site receives. People ask for autographs and phone calls, invite Joni to dinner, outline their sure-fire Morgellons cures, and almost always thank her for the great music throughout the years. Emails have arrived from childhood friends, promoters, producers, and famous musicians in their own right - trying to (re)connect with Joni. Occasionally, messages come across that really stand out. There was the time a guy named John Uren emailed and introduced himself as having hired Joni to play in his coffeehouse in 1963. That event turned out to be Joni's very first recurring paying gig, and John became a resource for much more as-yet-uncovered Joni history. A few weeks ago, a guy named Nick Edmonds emailed. Nick explained that he knew Joni back in the Fall of 1963 when they both were performing at John Uren's Depression Coffeehouse in Calgary. His story was that Joni had once played his guitar - a guitar he still owns. Always interested in fleshing out these stories as much as possible, we traded some emails and discovered there to be a bit more to the story. Nick was stationed at the local military base, in the Sarcee Barracks (later called CFB Calgary and closed in 1997), and would come play at the Depression as a duo with his friend Vince Adams. The two were military policemen and the Depression's no alcohol policy made it a good place for them to socialize. "There were a bunch of us from the barracks with our girlfriends, and for us it was one of the very few places we hung out. The Depression was always a bit loud except when anyone performed. No matter their stature as a musician the audience was always quiet and listened - the place was very friendly. And it was always dimly lit - except when a headliner like the Travelers were playing. There were many different acts who came through." "The music I played was quite varied at the time" Nick explained. "I had been playing ukuleles, guitars, and drums since I was about 12 years old. I had been in pipe bands and country bands although my love was and still is for Celtic and folk music. My influences were Woody Guthrie, Bob Dylan, Pete Seeger and Ewan McColl." "I was there in Calgary between July 1961 and January 1964" Nick wrote. "I met Joni at some point in late 1963. With my musical background I knew right away that Joni was a superb singer with a phenomenal soprano range. Her notes were very true. She was very open and friendly and yet shy when not onstage. There was no doubt in my mind she was going to be big. I liked her even better than Sylvia Tyson! She played a baritone ukulele during her sets to be precise, it was about the size of a tenor guitar." John Uren agreed with Nick about the instrument Joni played. In an interview with JoniMitchell.com, John stated that in September of 1963 "she auditioned for us right there and then, playing a ukulele - not a guitar." One night in the Fall of 1963 Joni came up to Nick at the Depression after he had performed. Nick remembers that "she asked me what the difference was between my guitar and her uke. I told her there were two more strings - a low E and A. The uke was tuned just the same as a guitar (D-G-B-E, low to high) but without the two bottom strings." That night Nick was playing his "Red Label" Nippon Gakki Yamaha "Dynamic Guitar No. 80", made in Japan. Yamaha began making this model sometime in the 1950s. Nick continued his story, "She asked me if she could use my guitar for her set that night and that she had never played a guitar in front of anyone ever before. I told her that of course she could and that she would have no problem learning it! She used my Yamaha and she did very well. I was not surprised at all as she was an excellent musician as well as singer." So, Joni made her public guitar debut that night at the Depression - never having performed on one before. This is not inconceivable especially for a notorious risk-taker and boundary pusher such as she. Perhaps there were a few clunky notes on those bottom two strings, but more likely she spent some time back stage prior to her set getting familiar with what she could do with them. At about this same time, in October of 1963, an article appeared in The Royal Reflector about the popularity of The Depression. It stated that Joni "performs mainly with a baritone ukulele and has recently acquired a Maritime Tiplie ten-string ukulele." A what? A maritime tiplie?? Not much has been written about Joni's transition from playing a baritone ukulele to tiplie (actually spelled "tiple" and pronounced 'teep-lay') to guitar. In fact, most people are surprised to hear she ever played anything other than a guitar. It's time to get to the bottom of this. 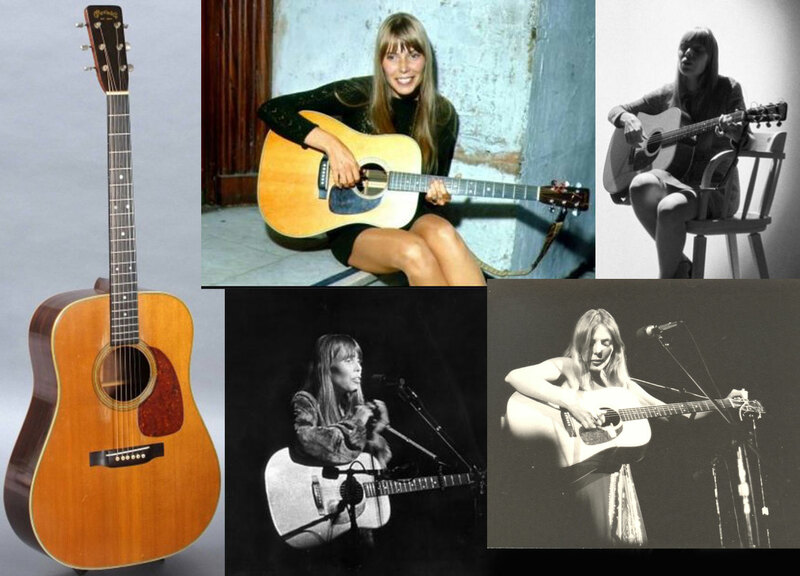 Let's look at the series of instruments Joni played in the early stages of her career. 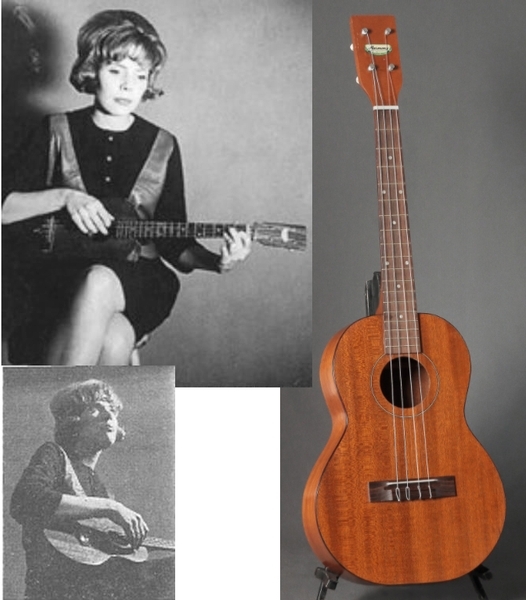 Indeed, the first instrument Joni played in public was the baritone ukulele. The Saskatoon StarPhoenix published an article in July of 1966 stating that "a love and appreciation for folk music possessed Joni to buy a ukulele, on which she practiced fervently day and night, her mother recalled." A June 1969 article in the Montreal Gazette recalled that "she bought a ukelele 'just to pass the time' and soon found she could earn pocket money by singing folk songs in local coffee houses." In his book "Reckless Daughter" David Yaffe asked Joni about her first instrument. "When I wanted a guitar, my mother said 'oh no no. You'll buy it and just quit'. I couldn't afford to buy it on my own. So I saved up thirty-six dollars... and bought this ukulele". A 1971 Rolling Stone article states that "In Saskatoon, she didn't show much interest in playing until her last year in high school. She bought herself a ukulele, taught herself the rudiments of guitar playing from a Pete Seeger do-it-yourself manual, and took to hanging out at a coffee house called the Louis Riel." I showed photos of Joni's ukulele to John Ramsey - guitar store owner, banjo player, guitar historian, and one of the finest luthiers around. He confirmed, with very little doubt, that Joni was playing a baritone ukulele made by the Harmony guitar company. A magazine ad during this period lists this instrument as selling new for $44 - which roughly compares with Joni's "thirty-six dollar" investment. In a 1993 interview, Joni stated that she got the instrument at "Gordie Brandt’s. Yeah, I got it at Gordie’s." Gordie (Gordon Edward) Brandt was raised in Saskatoon, and began playing guitar at 12. Although he was interested in jazz in his mid-teens, he first worked professionally 1940-41 as a member of a country group, Sleepy and Swede and the Tumbleweeds. He was the city's leading jazz musician and performed in concerts and in clubs. After he opened a retail and teaching centre in 1961 he was less active as a performer. The ukulele isn't a native or ancient instrument: it started with Portuguese immigrants to Hawaii in the late 19th century. It is not a direct descendant of any particular instrument; rather it is a hybrid, most likely of the machete and the five-string rajão. In 1915 the ukulele was shown in a Hawaiian exhibition at the Panama-Pacific International Exposition in San Francisco and that seems to have launched the mainland craze. That same year, Sears Roebuck bought the Harmony guitar company to make ukuleles and cash in on the craze. Ukes were mass-produced in the thousands . Arthur Godfrey is arguably credited with introducing the baritone uke which he asked Eddie Connors of Vega instruments to design for him. This spurred a mini-revival that lasted through the early 1960s. By that time, the changes in popular music saw the ukulele give way to the influence of the guitar. There are just a couple of photos of Joni playing this instrument, both from late 1963. This photographic evidence (and lack thereof) supports Nick's story of Joni beginning her transition to the guitar that night in the Fall of 1963. An article in the University of Toronto's 'Varsity' from October of 1964 stated that Joni 'accompanies herself completely on the guitar and something called a Maritime Tiplie ukelele which merely looks like a shrunken guitar with 10 strings." The tiple is still misspelled and misidentified but one thing seems to be confirmed - Joni has left the baritone ukulele behind for good. 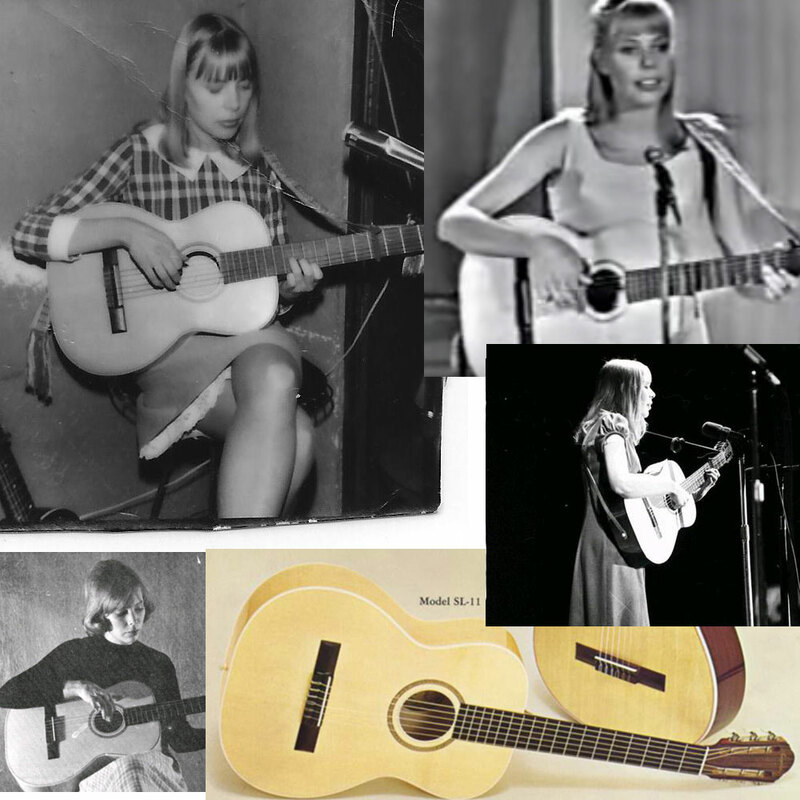 It's difficult to say which instrument Joni owned first, the guitar or the tiple. It's a pretty safe bet that they came within weeks or even days of each other - both in late September or early October of 1963. Brad MacMath, the future father of Joni's child, enrolled at the same art school as Joni in 1963. Within weeks of meeting each other he asked her out. They continued seeing each other over the winter while Joni was a member of the school's bowling club, a runner-up in the annual Campus Queen beauty contest, and launching her singing career at 'local folk clubs'. "I was with her when she bought her first 12-string guitar," recalled MacMath, who calls himself a 'non-musician.' This non-musician is forgiven for almost certainly mistaking the tiple for a 12-string guitar. The timing of his statement, however, helps confirm the narrative. The tiple is tuned similarly to the guitar and the uke, but that's where the likenesses end. The tiple is an unusual instrument for the fact that its ten strings are arranged into only four 'courses'. So just like a 12-string guitar (you were close, Brad) configured into six pairs - or courses - the tiple has ten strings configured into four courses. Low and high courses have two strings each - but the middle two courses have three strings each. We have only three existing photos (so far) of Joni playing the tiple - two of them are promo photos for the Chuck and Joni show. 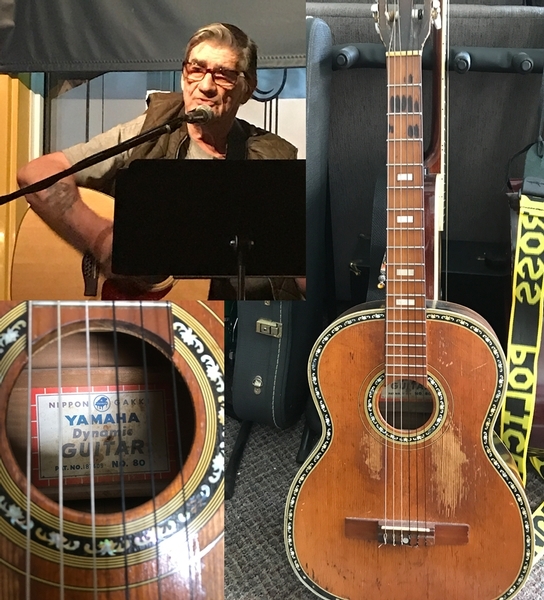 John Ramsey was able to immediately identify this as a Martin T-18 Tiple. It's not from the ukulele family (as the 1963 article claimed), but rather comes from a South American heritage. The tiple is associated with Colombia, and is considered the national instrument. This instrument was redesigned in 1919 by the American guitar company C.F. Martin (Nazareth, Pennsylvania) for the William J. Smith Co. in New York. The Martin tiple is smaller than the Colombian version, and closer in size to a baritone ukulele (aha!). Martin produced mahogany and rosewood bodied tiples, following a model-identification system similar to its guitars: the T-15 and T-17 had a mahogany top, back and sides; and the T-18 (Joni's) was built with a spruce top and mahogany back and sides. Martin's tiple production continued off and on into the 1970s. Joni's, obviously, was manufactured no later than 1963. 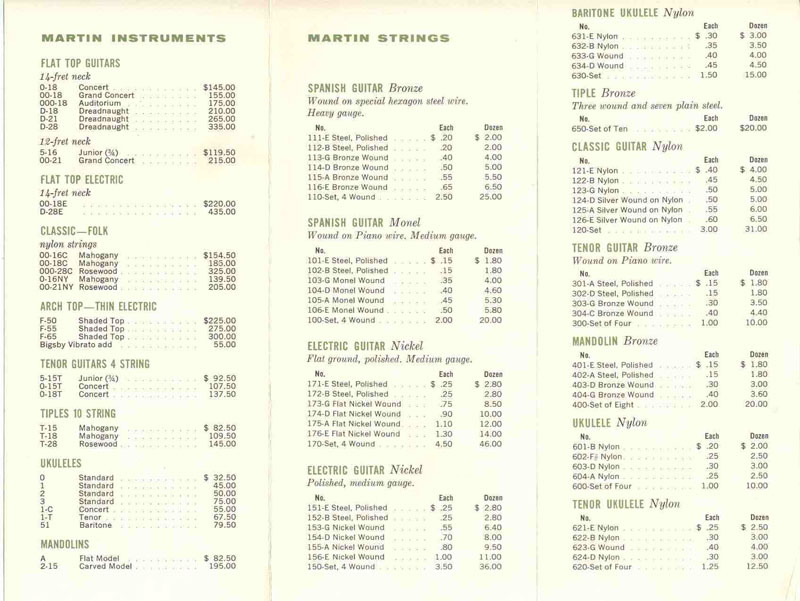 Martin's historical price sheet from 1962 put a new T-18 Tiple at a retail of $109.50. Although the tiple is traditionally tuned A-D-F#-B (low to high), an online blog about Martin Tiples indicates that one can tune it just like a guitar and a baritone uke if one wishes. Regardless of how Joni tuned it (we're pretty certain it was A-D-F#-B), the relationship between the strings is exactly the same as the guitar and uke. Musicians will understand that the chord shapes are therefore the same on all three instruments. It's just that when playing the tiple one would be in a different key, something one could easily compensate for and which would, in fact, allow more versatility rather than less. One can see how the transition between the three instruments would have been relatively seamless for Joni. How did Joni come upon this tiple and decide to purchase it? No one seems to know (except Joni herself). We do know that by mid-1964 - and probably earlier - she was playing it at her gigs. Perhaps she met a musician passing through the Depression who had one and sold it to her or at least inspired her to buy one. Recall the October 1963 article stating that she "recently acquired a Maritime Tiplie". Searching for 'maritime tiple' comes up with nothing. Perhaps this is Joni romanticizing the instrument as from 'across the sea' in an early attempt at creating a mystique. It's very likely that Joni was told or researched the history of the tiple and took advantage of its South American roots to pique a listener's interest - even though her instrument was made in North America by her southern neighbor. Chuck Mitchell remembers Joni playing the tiple at some of their early gigs in 1965. "I have a chiaroscuro memory of the high mandoliny sound it added to songs I accompanied on the 12-string," Chuck said, "one for sure being 'Duncan & Brady', and maybe 'Spring Is Oe'r The Land', the Gordon Lightfoot song." 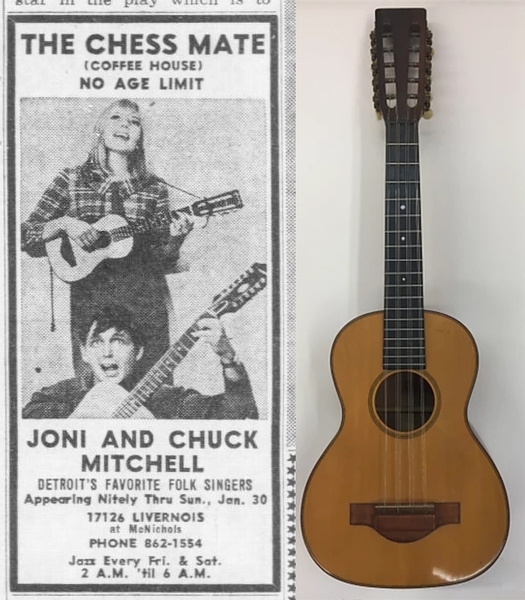 By about mid-1966, Chuck no longer recalls the tiple as part of Joni's arsenal. As Joni's playing evolved from her early strumming style to a finger-picking style, the value of the tiple as a performance instrument diminished for her. It had neither the necessary range nor accessibility to be played in the finger style, and Joni no doubt was growing beyond its limitations. There is an article in the Library, however, that disputes the timeline laid out here. Tracy Baker wrote in The Michigan Daily on July 22, 1967 that Joni "plays guitar, ukulele, and a South American instrument called the tiple, which she describes as 'a ten-stringed country cousin to the uke.'" This is the sole claim (and evidence) of Joni still playing the uke or the tiple this late in the game, and without more documented proof, we can only assume that the author is making a general statement about the instruments that Joni could play or had once played. There is no recorded or visual evidence of Joni playing the tiple later than early 1966 or the uke later than early 1964. Joni still owns the tiple. It hangs on the wall in her stone house in British Columbia. Joni began performing on guitar on the Fall of 1963, probably October or November. Not counting her night playing Nick's Yamaha, her first guitar was an España SL-11, a model first manufactured in 1961. The España line of guitars was made by the Swedish company Bjärton for Buegeleisen & Jacobson in New York - to be distributed in North America. A catalog from the early 60's shows this guitar retailing for $119.50 and marketed as "esthetically (sic) appealing to the folk singer". Espana guitars were widely available in Canada in the early 60's. They were carried by Eaton's - at the time Canada's largest (and now defunct) department store. At the company's peak, they had more than 90 stores in Canada, including in Calgary in 1963. And we know that Joni liked to shop at Eaton's. The SL-11 can first be seen being played by Joni during her appearance at the Allied Art Centre in Calgary in early 1964 - sometime prior to May of that year. Definitive photographic evidence is scarce around this time, but it seems clear that this was Joni's only guitar for more than 2 years. The last photographic evidence of her playing it was on the 'Let's Sing Out' TV program in October of 1965. 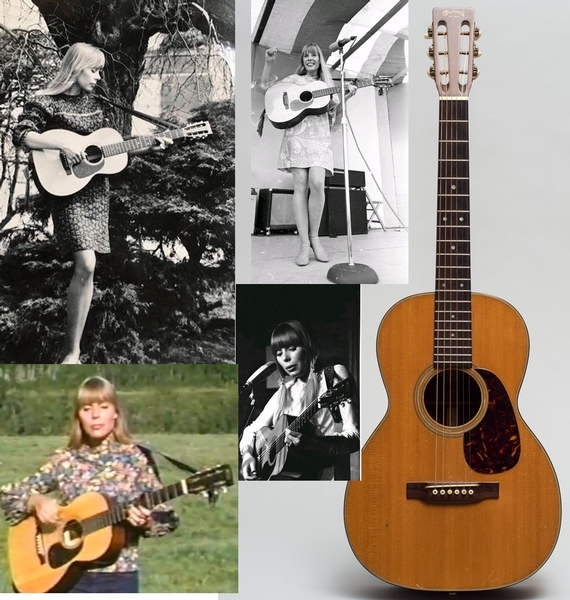 Joni's next guitar was a Martin OO-21 and was her first guitar of real quality. The first photographic evidence of Joni playing this guitar is from the Mariposa Festival in August of 1966. The 00-21 is a bit of an anomaly in Martin history. When the rest of the company's guitars were re-cast in 14-fret mode (the number of frets on the neck before it meets the body) after 1930, the smaller style 21 instruments were the only hold-overs maintaining the traditional 12-fret pattern. This model was in continuous production from the late 19th century until it was discontinued in the 1990's. The historical price sheet from 1962 shows that the OO-21 retailed for $215. The last evidence of Joni playing the OO-21 is in April of 1967 at Club 47 in Cambridge, Massachusetts. It may be, however, that these photos are mis-dated and are actually from December of 1966. If so, this fits neatly into the timeline of Joni acquiring her next guitar. Even if these photos are correctly dated as April of 1967, it's not unlikely that Joni may have still carried this guitar with her to certain gigs in addition to the next one she acquired. Perhaps Joni's favorite guitar of all time was the 1956 Martin D-28 that she got from a marine captain in Fayetteville, North Carolina. Joni has mentioned in a few interviews that she got this guitar in 1966, but it was most likely acquired within a day or two of January 3, 1967 when she went to play 'The Other Side' in Fayetteville. She is first seen playing her newly acquired D-28 while taping the 'Take 30' TV program for CBC in February of 1967. Joni told Martin Simpson in 1995; "During the Vietnam war I played in Fort Bragg for soldiers coming back from and going to the war. It was mostly a male audience. There was a captain there who'd been to Vietnam and returned, and he had two instruments that he'd taken with him. I guess this whole place was a battlefield, and shrapnel hit his tent and demolished one guitar. The only surviving thing was a Martin D-28, which I'd always wanted but couldn't afford. One night after I'd played, he told me, "Joni, you're better than Peter, Paul And Mary, and you should have this guitar," and he told me the history of it. Being an independent girl, I said, "I couldn't take it as a gift, but I'll buy it off you." So he sold it to me for nothing really--a lot less than its value at that time. That guitar, which I used for at least my first four albums, was superb. It got cracked on the airlines--its face got crushed. It was repaired, but it never sounded right. It just died." This guitar was made by Martin at a vintage period in which the Brazilian rosewood used was "old growth" and thus had a unique character and tone to it. The year 1956 saw only 702 Martin D-28 guitars produced compared to, for example, 5,980 D-28 guitars made in 1973. The D-28 retailed for $335 back in the mid 60s. A quick check of current prices for a vintage 1956 D-28 land at about $10,000. This was indeed a special guitar. Unfortunately, it was stolen from Joni off an airport luggage rack in Maui in 1974. Joni's increasing fame and wealth from this point on allowed her to purchase many other guitars throughout her career. Two articles from the library, one from 1996 and one from 2013, detail a few of these. Joni continued to expand her stringed instrument interests and became known for her dulcimer playing as well, an interesting story in its own right. As for Nick? "I have never stopped playing music" he wrote. "I played in a pipe band and we had a country band named The Western Highlanders that played regularly. I have continued with my own music and have written a bunch of tunes as well. Now I play for retirement homes and at the London Music Club in London, Ontario where I live." Keep on pickin', Nick, and thanks for sending the email that inspired this article. Note: The close-up, full-bodied pictures of the instruments are not actually Joni's instruments, but the exact model from the same (or close) year. The Yamaha, however, is the exact guitar Joni played. This article has been viewed 6,771 times since being added on October 28, 2017.